Hello and thank you for calling by my page. My name is Carol Omer I am an Artist, Writer and Certified Life Coach living in Adelaide, South Australia. I am an Australian for Reconciliation and acknowledge that I am living and creating on traditional Aboriginal Land & pay my respects to the Kaurna people, the Elders and the Ancestors as the traditional owners of the Adelaide Plains. My husband David Salomon and I own and operate Simply Splendid Productions and have recently launched the new documentary Two Brothers Walking in partnership with senior members of the Anangu and Kuku Yalanji Communities. 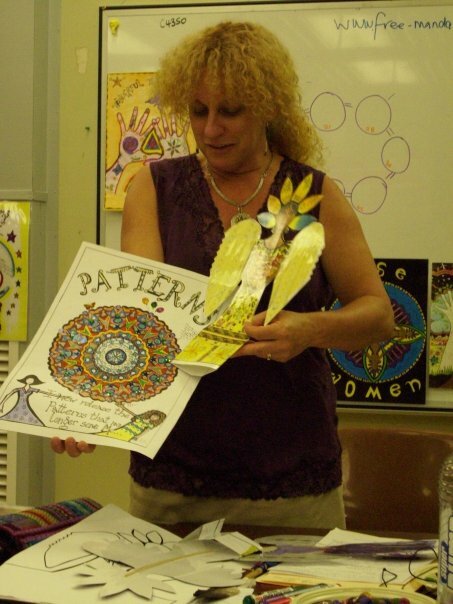 I worked in homeless and domestic violence shelters and community health & human service settings for over 25 years and create women’s personal development and life coaching art for relaxation, self reflection and fun! I specialise in the Mandala art form & have facilitated the ART of Change, a creativity based life coaching program since 1997. The ART of Change is delivered as both a one on one Life Coaching program and in group settings such as staff training, community centres and women’s groups. Mandala is a Sanskrit word meaning Circle & after reading Carl Jung’s first hand experiences of the power of Mandala as a tool for healing and transformation I began to study them as a possible tool for my women’s personal development programs. I quickly saw how the Mandala engages people on many levels as they generate restful thinking and deep breathing that is a form of open eyed meditation. The Mandalas are portable, they can be coloured on long flights, on outdoor picnics or whilst propped up in bed on a sleep in day. Many women enjoy getting together for Saturday Crafternoons and colouring in a Talking circle, sharing food and stories. My Vision is to create Mandalas that are meaningful, that make a difference in womens lives. I receive feedback that they have travelled into hospitals and cancer wards, accompanied women on retreats and during overseas travels and others have been shared between mothers and daughters who last sat down & created together many years ago. I am honoured to create interactive art work that has been inspired by both ancient & contemporary traditions. Indigenous cultures have used the circle as both a ceremonial & creative tool for thousands of years & contemporary psychology recognises life coaching as a significant tool for self development & goal setting. The Big Girls Little Colouring Book has been designed to let our hands do the thinking and allow our mind to rest and play for awhile. The Art of Change life coaching and staff development program takes hands on training to a new level. I saw you on Powerful Intentions and felt compelled to go to your site. This is quite amazing for me, as I am reading about you and looking at your picture, I feel so much love and joy welling up inside me. I would be blessed to be your friend, and I am trusting my inner-love that I am contacting you for a reason, and I feel overcome by your love and beautiful self. The only way I can put it, is that you feel like “home” to me. Like a mother. I love australia and ……….John Willamson s music ……. I remember fondly our time at Jean’s workshop on the Mornington Peninsula and your gorgeous shining aura! I’m still learning – up and down – and searching….that seems to be my fractal, that and the communicator – the Hermetic fractal that Jean talked about. When I look back on the time that has passed I’m shocked at what I haven’t achieved…but take comfort in the fact that it’s a process, ongoing, never-ending….bless you for all the wonderful work you are doing, I just adore those river gums and would love to paint them! I found this site( by accident) so inspiring plus I have always been curious about Australia.,I just looked on Google to find out about the Baha’i community in Australia, and stumbled onto your website. Forgot all about what I was looking for and forwarded this to my e-mail friends about the animals. Beloved Pets column. I kept on reading and it made me feel very good.Thank you.It is so full of love and compassion.Also similar Baha’i spirit. I live in the Netherlands now I was born in Jacarta Indonesia and lived 30 years in California.I love art. thanks so much for being able to visit with you this way. I have this page listed on Google if they click on my name. on my Hyves.nl page. For now only friends and relatives can see it. Amazing how you seem to cross my internet path.It was listed automatically, I was surprised to see my name on Google.referring to your weblog by clicking on my name. and now you are listed on my Hyves,page again! I think you are doing great work with all the people involved also, working with you. I love to listen to Jean Houston as you mentioned her in one of your articles.A different world is opening up for me. Thanks to you and Jean. to continue. We need to change. Thank you Sister you are truly a most wonderfull human being, we all are,it”s just some of us are still finding ourselves. when i was asked by you to write a poem about my aboriginal identity i looked in the thesaurus and found $100 i had stashed and forgotten about! Thank you. I found your blog through DailyOM. The world is so intricately inter-connected. i have sub’d to your blog since i found it a while back through a google alert for mandala art. most recently i have begun trying to understand sacred geometry just a little bit better. i know the mandorla as the vesica piscis. it is one of my favorite symbols and one that i feel whenever i come together with another and feel the power of spirit between us. your intro, work and vision inspire me with possibilities. now let’s make it happen one more step at a time. To whom in charge of this site. I am asking your permission to link this site to my site notified above. **I am very happy for you to do that Shuhei and thank you for doing so. I read “The Magical Child in Exile” and it has helped me to understand the child I had 45 years ago. This could have been so helpful to him, me, his father, and the rest of our family. He was considered hyperactive and his family, teachers, and friends struggled to make sense of his behavior. Back then his middle name was, Don’t. How sad. The information I sought then boiled down to just give him love. Carol, you really need, or we need, you to write that book. I loved reading your stuff and as you said “As you become older you appreciate the land we grew up on” I know I certainly do now at 55yrs old with two married daughters. I will certainly look for your work as it certainly helped me finish my work the way I wanted too. With feeling. I love the Vision Statement painting. Says it all. And thank you for the work (from the bubbling enthusiasm that is obvious in your words, I’m not certain the term “work” would apply), the empowerment, you and your team are effecting in the lives of so many. Bless you. This is a personal contact.I am a blast from your past! I used to be Susanne Gray and was priveleged along with you to spend two years with the best teacher in the world-Rod Kemp. I am committed to Reconciliation and work for The Salvation Army in The Riverland as a Program Facilitator and Support,working with Families who are homeless.I currently run a program called ‘Lets Live’which is a Reconcilaition project working with Aboriginal and non-Aboriginal women together who have issues of Homelessness.We are using weaving as a medium to teach other life skills and provide an access point for Service Providers; mainly Health, to improve the lives of people who are marginalised. Interstingly it appears we have a lot in common in regard to our love of Our First Peoples. I have fond memories of you Carol and it was a lovely surprise to be sent an email in regard to you.35 years later here we are! thank you I would really appreacite it. you seem to be such a wonderful person I would love to gain some wisdom from you. I do acknowledge that you are probably really busy. but it would be cool to chat. Last year I completed my Social Work placement at Enfield Primary Health Care. As a part of my placement I observed your ‘Art of Change’ group for women with anxiety and depression. We made empowerment necklaces and Mandalas. I thought it was a great workshop for women who struggle with different issues in their life and gives them a real sense of empowerment. I have a friend who is going through a rough time at the moment and I was interested in knowing if you have any workshops coming up in the near future as I think she would benefit from your Art of Change womens group workshop. The underlying theme…….Yup, I like that! !